I will post properly as soon as I can, but here is the 2014 Messier Marathon crew. 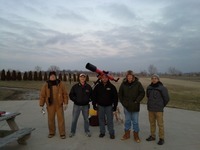 We had a clear sky all night, but uncomfortably cold temperatures most of the night. L-R: Larry, John, Mike, Richard, Bill. No way was I able to participate, but nice that you brave souls pushed against the cold and, at least here in the city, was a clear deep sky. I anticipate the narrative and pics on the marathon session.